Monday, after work I took Logan to his voice lessons. The studio is in an old strip shopping center and I like to walk around rather than sit in the waiting space. Last week I featured a recently abandoned Shell Station at the center. 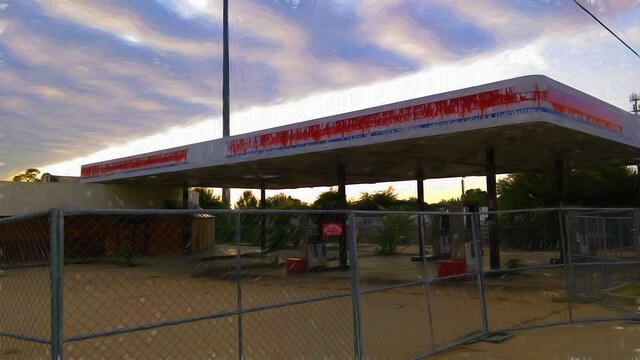 Well guess what, there is another abandoned Gas Station a couple hundred yards south of the Shell Station. I think it has been boarded up ten years or so. I forget what chain had the site. They left their old sign up and I always get a chuckle out of it. Since the station went out of business the prices listed have sometimes seemed like a huge bargain or a big ripoff. Right now they are just a moderately good deal. 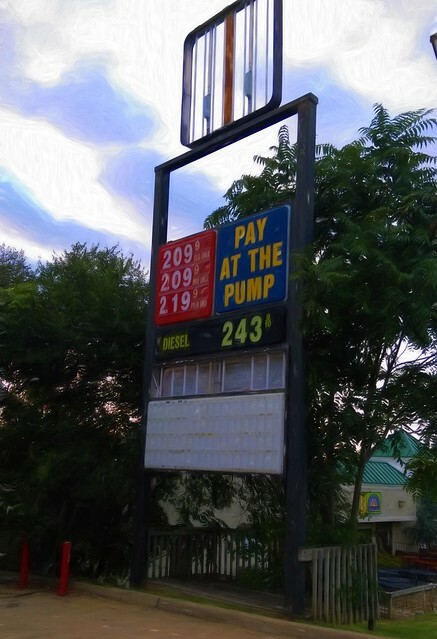 This entry was posted in Signs and tagged Abandonment, Digital Art, Gas Stations, Signs, Signs Sighs, Tulsa on August 24, 2015 by Alan Bates.